Russian town, in the government of Grodno. 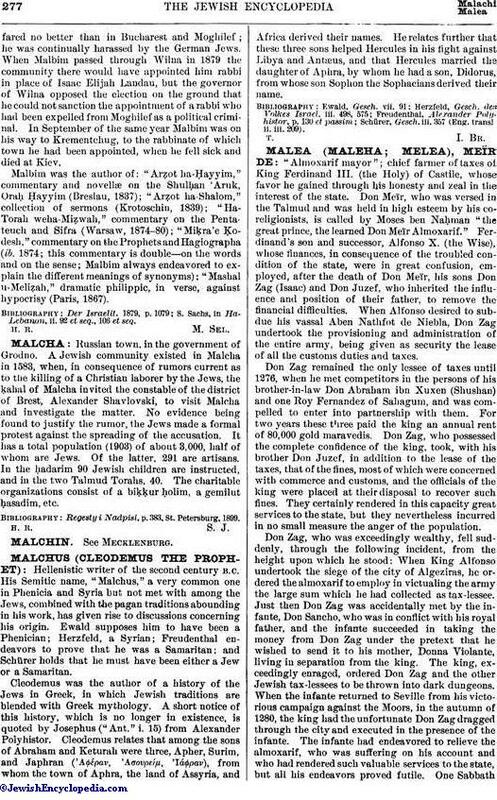 A Jewish community existed in Malcha in 1583, when, in consequence of rumors current as to the killing of a Christian laborer by the Jews, the ḳahal of Malcha invited the constable of the district of Brest, Alexander Shavlovski, to visit Malcha and investigate the matter. No evidence being found to justify the rumor, the Jews made a formal protest against the spreading of the accusation. It has a total population (1903) of about 3,000, half of whom are Jews. Of the latter, 291 are artisans. In the ḥadarim 90 Jewish children are instructed, and in the two Talmud Torahs, 40. The charitable organizations consist of a biḳḳur ḥolim, a gemilut ḥasadim, etc. Regesty i Nadpisi, p. 383, St. Petersburg, 1899.